Passion for the Past: Zap! You Are Now in 1850...What the Heck are all These Mills for Anyhow? Zap! You Are Now in 1850...What the Heck are all These Mills for Anyhow? As you move about your modern town or city, chances are you will see factories. I know within a two mile radius in any direction from where I live I can come across multiple factories - dozens, perhaps - employing a wealth of workers who make the items (or parts of items) we need and use on a daily basis, whether plastics for limitless things (practically everything we use today has some plastic in it) or metal (automobiles and small engines mainly). And we think nothing of these (usually) brick enclosed and somewhat dirty industrial buildings. I've even seen factories way out in the country, pretty much in the middle of nowhere. We also see delivery trucks come and go daily at these places, picking up or dropping off parts. And that's another piece of our daily lives we think little about: delivery trucks. They are everywhere, aren't they? Coming and going, moving day and night to deliver the all-important merchandise in a timely manner. And you have landed in 1850 - right smack-dab in the middle of the 19th century! What now? You have no money or food...you need to get a job. At the sign post up ahead...you find the way to town. One thing you will notice as you walk along the road to town is the absence of the dozens of factories. Not totally, mind you, for there are a few, such as iron, glass, and textile factories. But not nearly as many as in the 21st century. However, one common type of industry you will see in 1850 that is a rarity in the 21st century are the mills that were so prominent. I googled "21st Century Mills" and, well, click the link to see where that took me. Now look what happened when I googled 19th Century Mills. What a difference, eh? Yes, we still have cider mills in our modern age - practically every city person visits the cider mill come autumn. And for the most part these were built in the 19th century, many even using 150 year old machinery to run them. But the rest of the mills are no longer around for the most part, or are so few that you really have to search far and wide to find one. Unless, of course, you go to an open-air historical museum - that's where I had to go to get most of the photographs in this post. But there are a few still left in their original locations. In fact, my wife and I very recently actually had to find a working carding mill. You see, she does spinning on a spinning wheel and this past Christmas I bought for her seven pounds of raw wool, not knowing she still had a couple pounds that she purchased for herself earlier in the year. She really does not want to pick through, card, and wash all of this wool before spinning - as a working woman outside the home, that would take a mighty long time to do - so I had to search for a place that still does this process. I found a (very) few here and there, and we chose to go to the one up in Frankenmuth (about an hour and a half drive north of Detroit) called Zeilinger Wool Company. 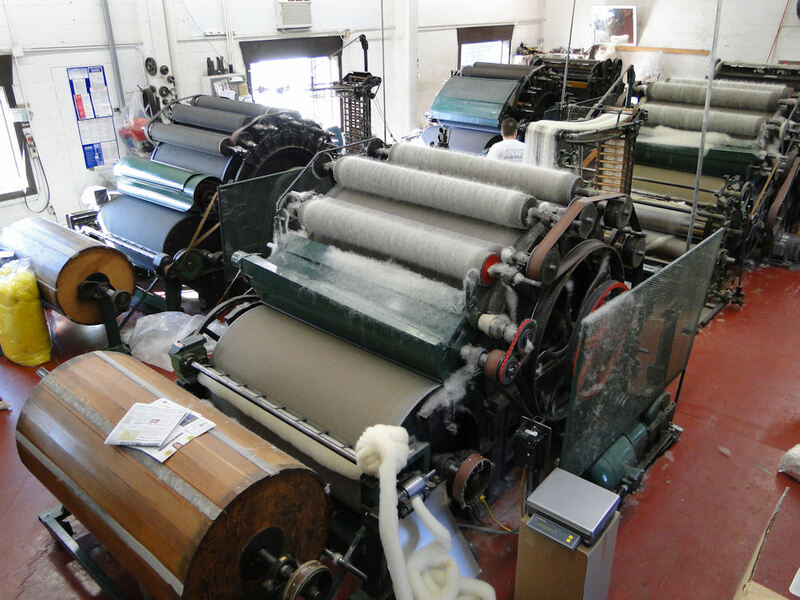 They use 100+ year old carding machines to prepare the wool for spinning. 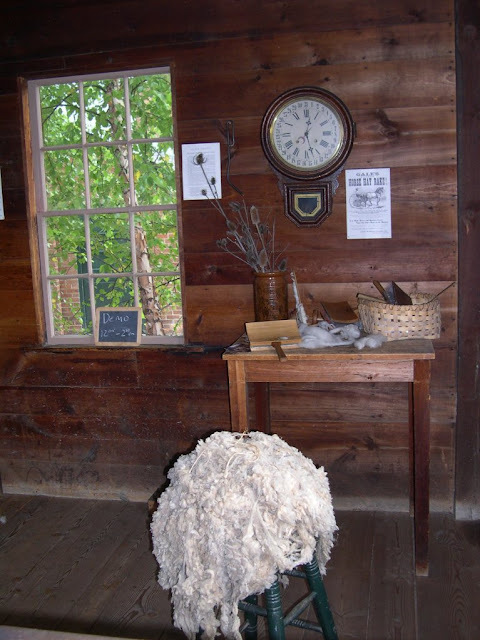 As odd as it may sound, it was kind of neat to have to go to a carding mill to get our wool prepared. If you include our trip to the cider mill last fall, we visited two traditional-type mills over the past five months. And that got me to thinking about other mills I might have visited had I been living back during the mid-19th century. Suddenly, without warning, I found myself in a dimension not only of sight and sound but of mind. This post is in no way an in depth report of mills, but rather a quick overview. 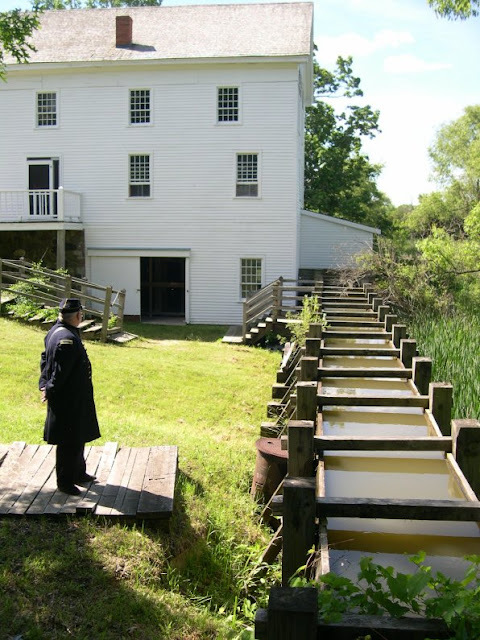 This is the Gunsolly Carding Mill, originally located in Plymouth, Michigan. 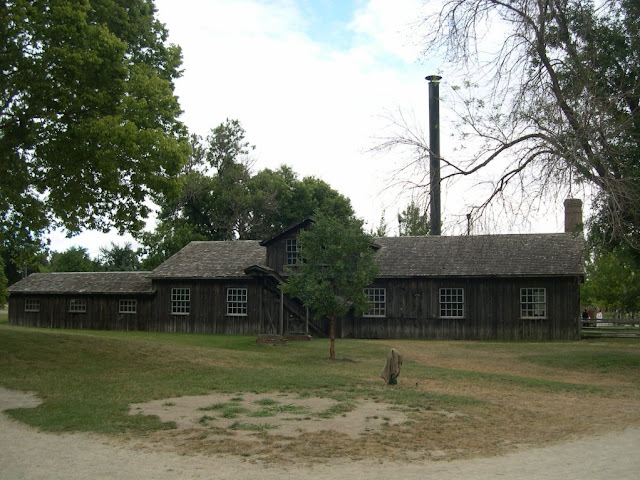 This circa 1850-51 mill, built by John Gunsolly, was originally located on the Middle Rouge River, and illustrates the changeover from hand-operated (carding paddles) to labor-saving mechanical equipment brought about by the industrial revolution, which resulted in the mass production and mass supply of goods. One must remember that until the mid-19th century, America was basically a hand-crafted nation, with artisans working at home or in small shops where the human hand was the main source of power. Future auto magnet Henry Ford and his father (and many other farmers in the area) used to bring raw wool sheared from their flocks of sheep to this very mill where the wool was carded, a process where fibers are opened, cleaned, and straightened in preparation for spinning, and then made into rovings (a long and narrow bundle of fiber with a twist to hold the fiber together), which were then taken home for spinning into thread or yarn by their wives and daughters. John Gunsolly ran this mill from 1850-51 to 1870. Many farmers would exchange their loads for a proportionate amount of the carded rovings instead of paying cash - a barter system. By the end of the 19th century, larger mills, many located on the east coast of our country, took away business from the smaller ones such as this. There is really not much of a difference between the Plymouth Mill and this one except the machines here are a bit larger. But the process is the same. 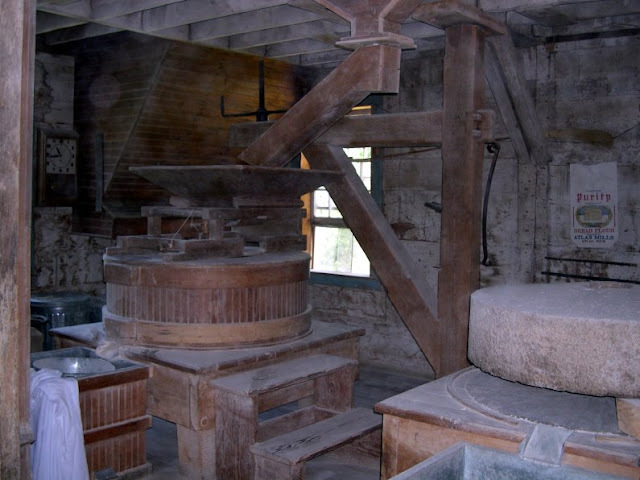 From colonial times and into the first half of the nineteenth century, gristmills flourished in America by meeting an important local need in agricultural communities: grinding the farmers' grain into flour with large, circular stones, and levying a toll, usually in kind, for the service. The founding father of Atlas, Michigan was Judge Norman Davison, who arrived here in 1831 from Livingston County, New York. He cleared the land and built a house for his family near the river on the site where the Atlas Country Club now stands. Soon after Davison settled in this location, many more settlers came to the town, and it was here that he erected a gristmill in 1836. With the increase of families coming to the area, a school was started in 1837. One can just imagine this small mid-19th century town, how it looked in the early days. 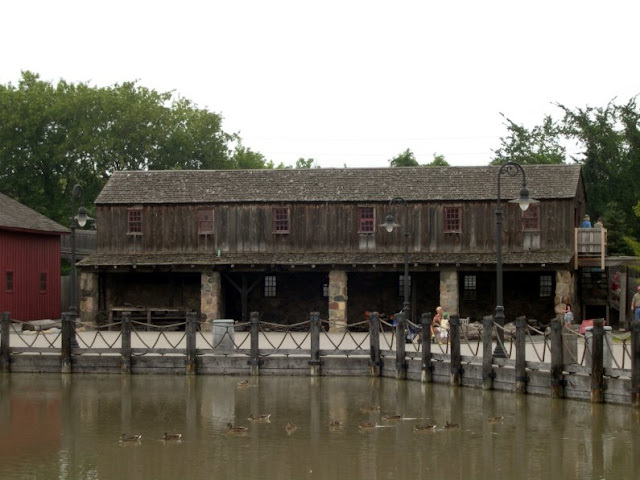 Probably very similar to what Crossroads Village open air museum looks like today. Gristmills flourished in America by meeting an important local need in agricultural communities by grinding the farmer's grain into flour. It is operated by water-driven turbine beneath the water surface so the mill can operate in winter if the surface of the water is frozen. The water power turns the large stone wheels used for grinding. Each granite stone, which were made around 1835 in North Carolina, weighs 1800 pounds. The grain slides down the chute to the “hopper,” which has a funnel-like appearance. The hopper disperses the grain to the stones to be ground and emptied out into the flour bin, ready to be sacked for the customer. 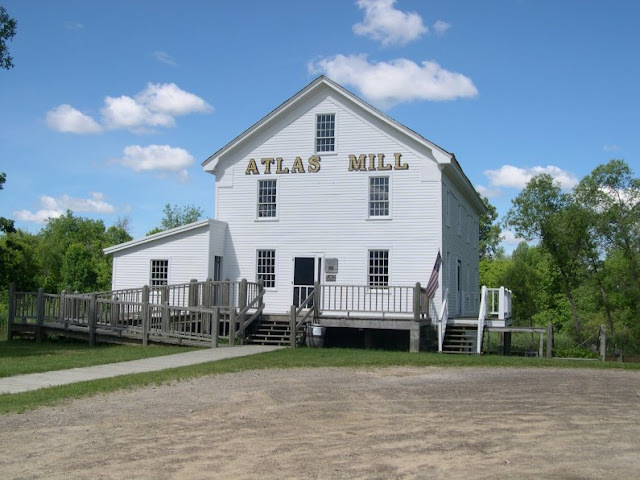 The Atlas Mill remained in operation until 1943, when, due in part to WWII, replacement parts for repairs were no longer available. The mill was dismantled and moved to Crossroads Village in 1975 where it was renovated and then moved, in 1977, to its current location inside the Village. The sights and sounds of the spinning, grinding wheels give the public a first-hand glimpse of an earlier age. The turning wheels could grind one barrel of flour (whole wheat or buckwheat) or corn meal an hour. An early portrayal of living history. So real, in fact, that one can just imagine local farmers, with their pack horse, ox cart, or on foot, coming to the gristmill from miles around, carrying the grain to be ground into flour. It now produces stone-ground flour sold in Crossroads Village. 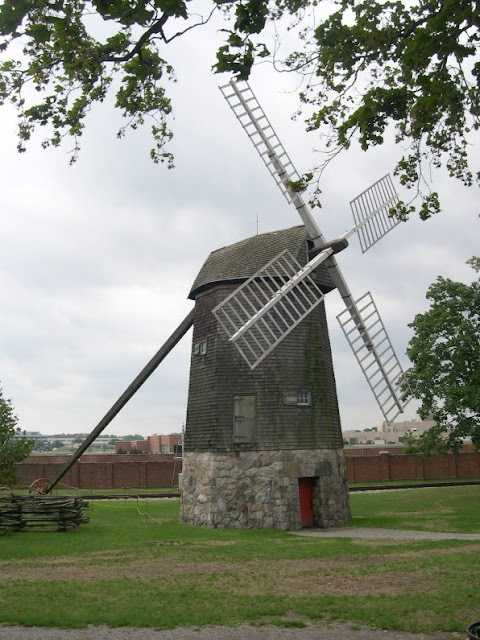 Named after the Farris family, who ran this mill for three generations, this windmill is said to be the oldest windmill in the United States, built in 1633, and stood at the road to West Yarmouth, Massachusetts. It now stands at the southeast end of Greenfield Village.
. 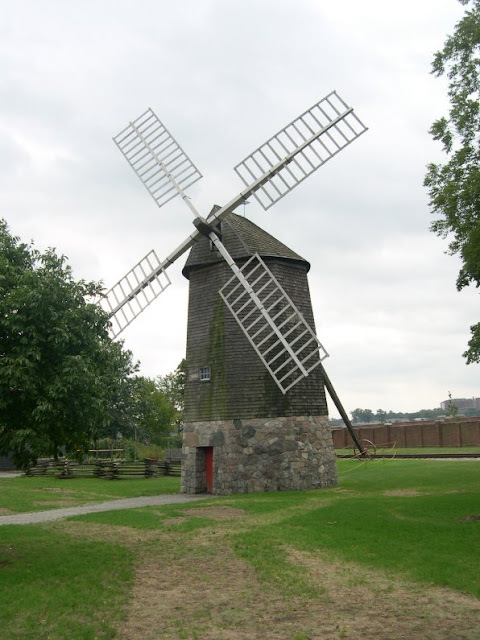 This mill was built like those the early pilgrim settlers had seen during their exile in Holland. Young men were induced to become millers by being exempted from taxes and military duty. Winds off the Atlantic and Cape Cod Bay turned the mammoth fifty four foot sails, grinding corn into meal in ten minutes or in three hours, depending on the wind force. The long lever between the roof and the ground is used to turn both the roof and the sails in the most favorable positions.This mill was moved several times, that being easier than finding a millwright to build a new one. The initials "T.G." and "1782" were carved in one of the beams during a move. The interior has a winding stairway which leads upward three stories from the ground level to the revolving roof area. 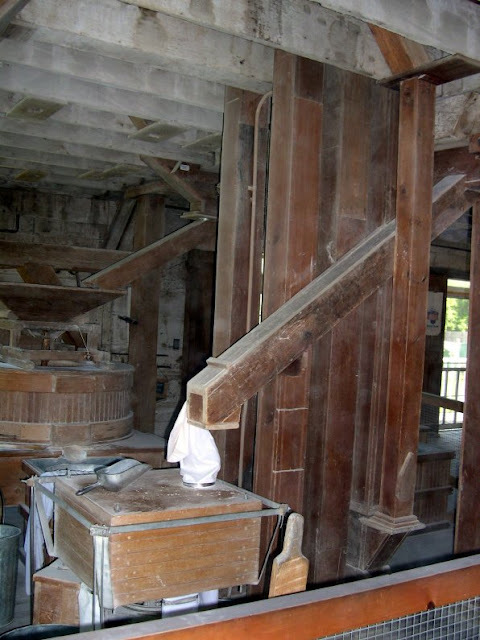 On the second floor above the foundation are the millstones, which are turned by wooden gears, and below are the hoppers and bins which hold the grain and meal. From the gristmill and windmill we'll head over to the Cider Mill. 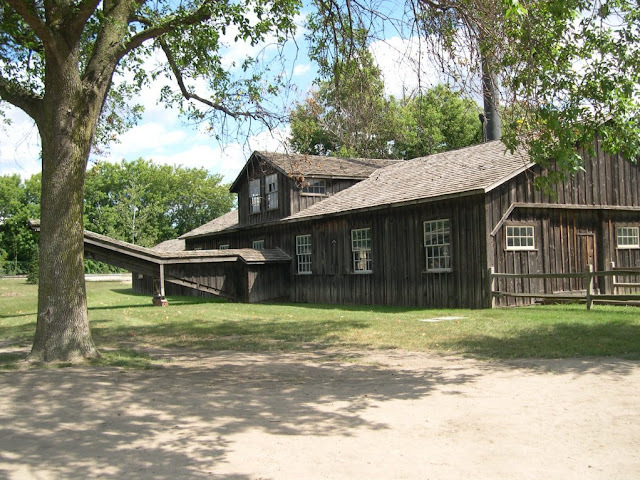 This cider mill is a replicated 19th century mill that was constructed inside of Greenfield Village in 1942 to conform with the 19th century cider making machinery Henry Ford had in his collection. Demonstrations of pressing apples into cider took place here every fall for many years up until recently. Sweet and hard cider, as well as cider vinegar, were important orchard byproducts essential to the economy of rural communities. 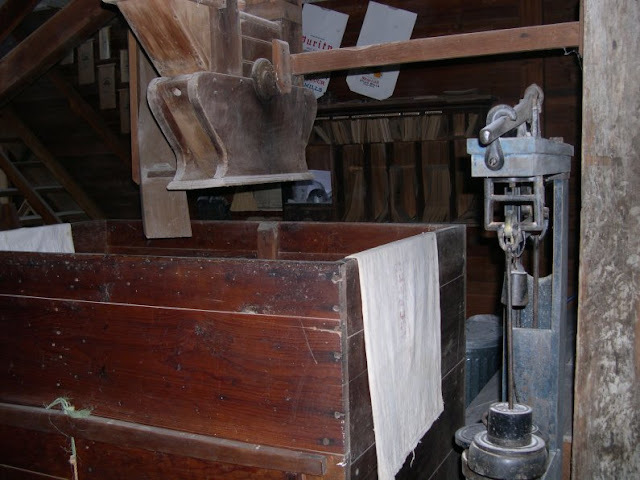 In the 1800's, farmers could haul their apples to cider mills like this one to have them ground and pressed into cider. The cider making equipment in this building came from a mill in Martinsville, Michigan. Cider, by the way, was the most popular drink of the 19th century. And cider mills are still very popular here in the 21st century. Here in Michigan one of the busiest we have is Yates. 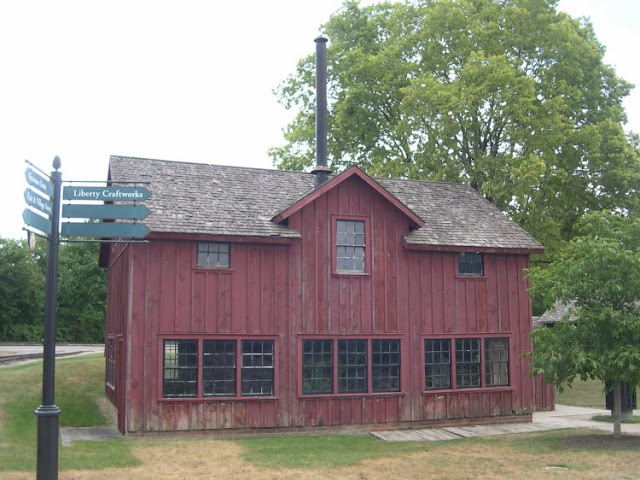 With a history that dates back to 1863, Yates Grist Mill opened its doors beside the rapidly flowing waters of the ‘then’ Clinton-Kalamazoo Canal (now the Clinton River). The Clinton River cascades over the Yates dam, which supplies the headwaters to power the mill. The dam was built to create a stream that the mill uses for water power. By 1876, the Yates family installed a cider press into the existing water-powered process and began producing delicious Michigan cider. It then became known as Yates Cider Mill. 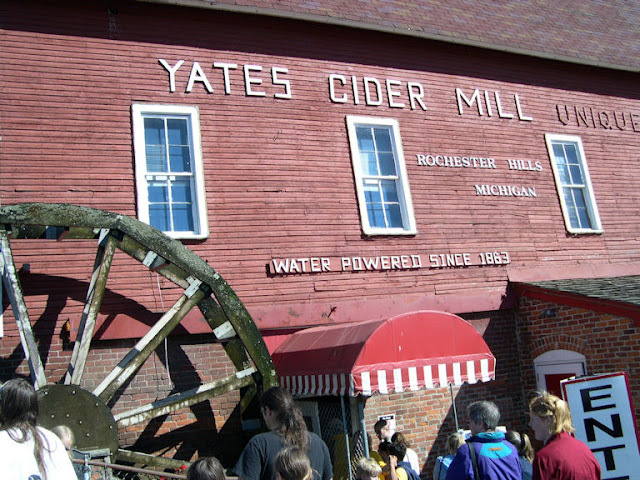 Local farmers, orchard owners and landowners would bring their apples to Yates for custom apple pressing. Over all these years, Yates has been producing the same kind of fresh 100% all natural cider that folks enjoyed way back in 1876. Now we'll head over to Hanks Silk Mill, which produces (according to the Hanks brothers themselves) "the oldest and best brand of silk on the continent." 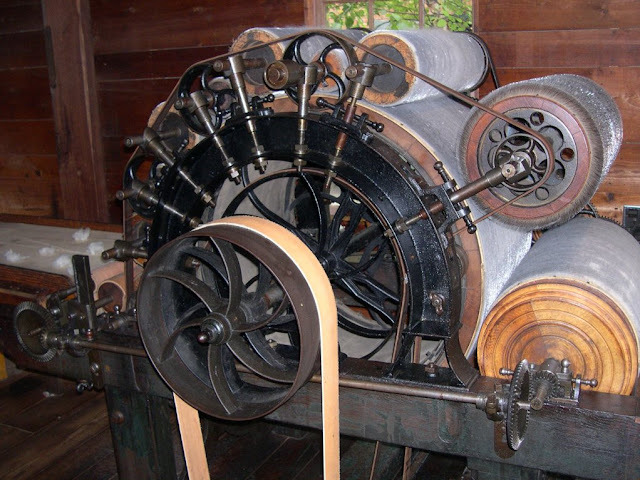 Hanks Silk Mill was built in 1810 by Rodney and Horatio Hanks in Mansfield, Connecticut, and produced the first machine-made silk in America. The Hanks brothers originally built the mill over a waterway which they had diverted from a stream. As with many mills, the water fell from a large flat rock onto a mill wheel. 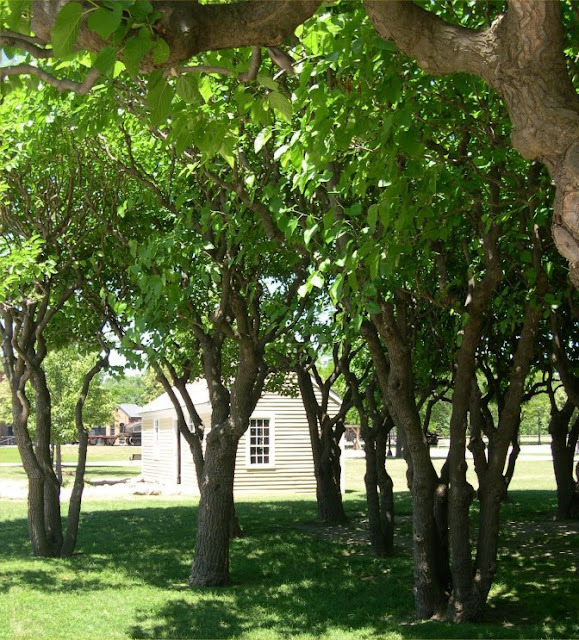 Once moved to Greenfield Village, the wheel was removed and a nearby grove of mulberry trees were planted especially for the mill, providing food for the young silkworms needed to produce the cocoons. Although the mulberry trees are still there, this production is no longer presented at the mill, as the time and energy it took to produce the silk was too time consuming for the little amount provided. The original machinery of this mill burned, leaving just a few iron parts. But, the visitor can still see the same type of wooden reeds that once wound the thin strands of silk, as well as the parts that twisted the strands into a thread in tact as Mr. Ford had a reproduction of the machinery built. From the Hanks Brothers mill we move to the Fairfield Rice Mill, of which William Alston had erected in 1787. Once situated on the Fairfield Plantation at the Waccamaw River near Georgetown, South Carolina, this brick building housed the threshers, grindstones, shafts, and pulleys needed for the miller to do his job of threshing the grains of rice. A rice huller or rice husker was an agricultural machine used to automate the process of removing the chaff and the outer husks of rice grain and, although I have no positive proof of this, was more than likely used in this building. The Cotton Gin Mill, originally from Richmond Hill Plantation in Ways, Georgia, is said to be the only building on the plantation that remained standing after General Sherman marched his troops through the district on their way to the sea in late 1864. The architectural development of the cotton mill was linked to the development of the machinery which it contained, the power unit that drove it, and the financial instruments used for its construction. The process led to combined mills where carding, spinning and weaving took place in the same mill. Mills were also used for finishing such as bleaching and printing. 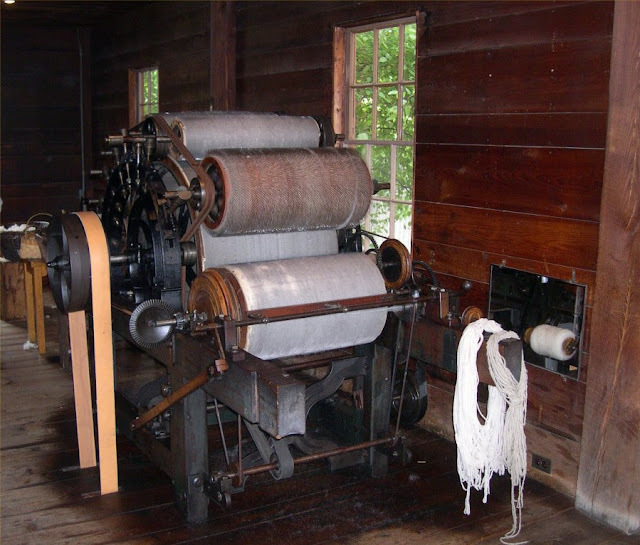 Prior to the introduction of the mechanical cotton gin, cotton had required considerable labor to clean and separate the fibers from the seeds. With Eli Whitney’s introduction of “teeth” in his cotton gin to comb out the cotton and separate the seeds, cotton became a tremendously profitable business, creating many fortunes in the south. The invention of the cotton gin caused massive growth in the production of cotton in the mainly southern part of the U.S. Cotton production expanded from 750,000 bales in 1830 to 2.85 million bales in 1850. As a result, the South became even more dependent on plantation and slavery, with plantation agriculture becoming the largest sector of the Southern economy. By 1860, the southern states were providing two-thirds of the world’s supply of cotton, and up to eighty percent of the crucial British market. Now I know that Wikipedia cannot always be relied upon but in double checking the information I found it to be correct. From the cotton mill we'll move to the Sorghum (or sugar) Mill. This Sorghum Mill, believed to be from the 1850's, was reassembled from an old sugar mill found in Louisiana near Harahan not far from New Orleans. Most communities had a sorghum mill. During the autumn, sorghum cane raised in fields and farmers brought their harvested cane to the mill. In the cane mill, the 6-to-12-foot stalks were crushed between rollers powered by a water wheel or, in some instances, a mule walking in a circle, to extract the juice. The resulting juice was boiled down in large pans to a thick, sweet syrup. As the juice is boiled down, greenish foam is skimmed off the top. When the amber-colored syrup reaches the desired consistency, it is cooled and put up in jars. Drizzled over hot biscuits and cornbread, added to baked beans, and gingerbread, this sweetener, sometimes referred to as molasses, has flavored many a meal. It was also poured over pancakes and biscuits, and used as an ingredient to flavor cakes, cookies, and candy. Some people still prefer it as a sweetener, and a few still make it. But its consumption has now been surpassed by the granulated white sugar bought in grocery stores. 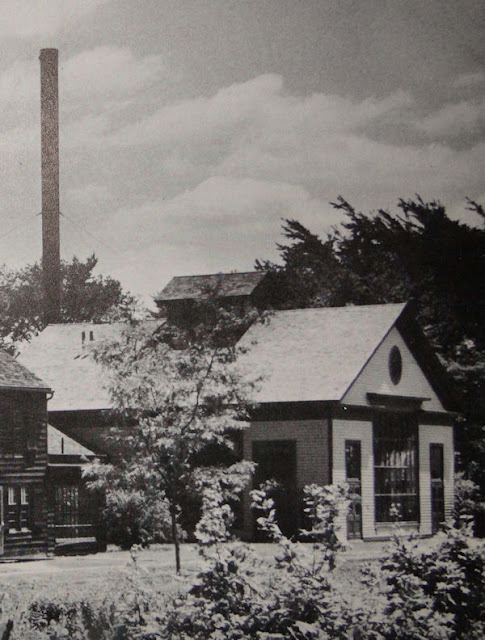 These are the only photos I was able to obtain of both the Cotton and Sugar mills, and I had to get them from an out-of-print book I own ("Greenfield Village: Preserving America's Heritage"). I wish I had thought to photograph them during one of my visits years ago. 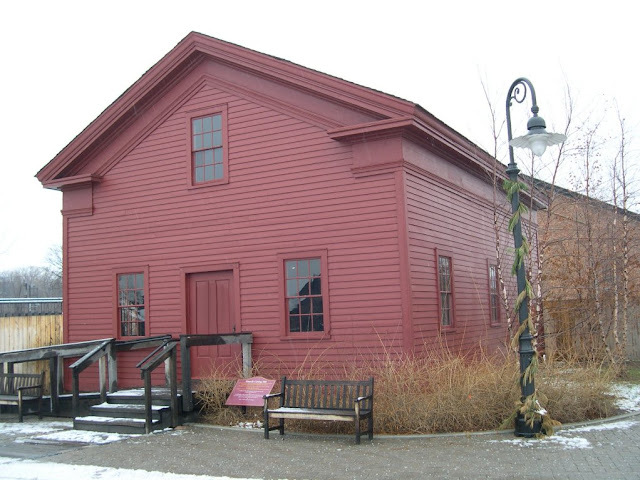 Built on a stone foundation, the Spofford Saw Mill was built in Georgetown, Massachusetts in the late 1600's by John (or possibly son Abner - or both) Spofford. Lumber from this mill was used to make houses, barns, shops, and possibly ships. 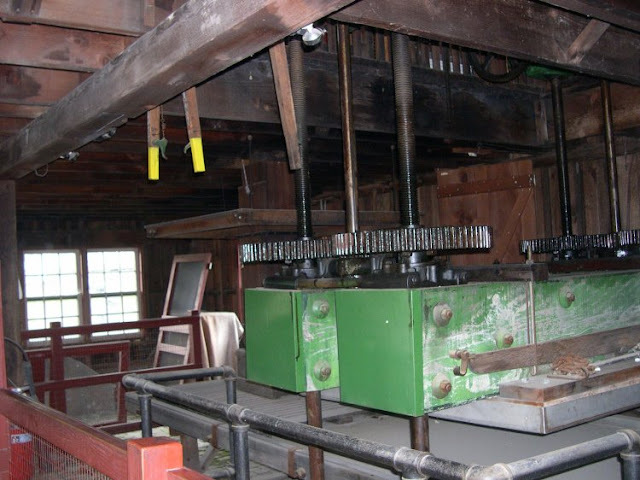 This is an "up-and-down" saw mill, and is one of the earliest water-run saw mills still in existence. 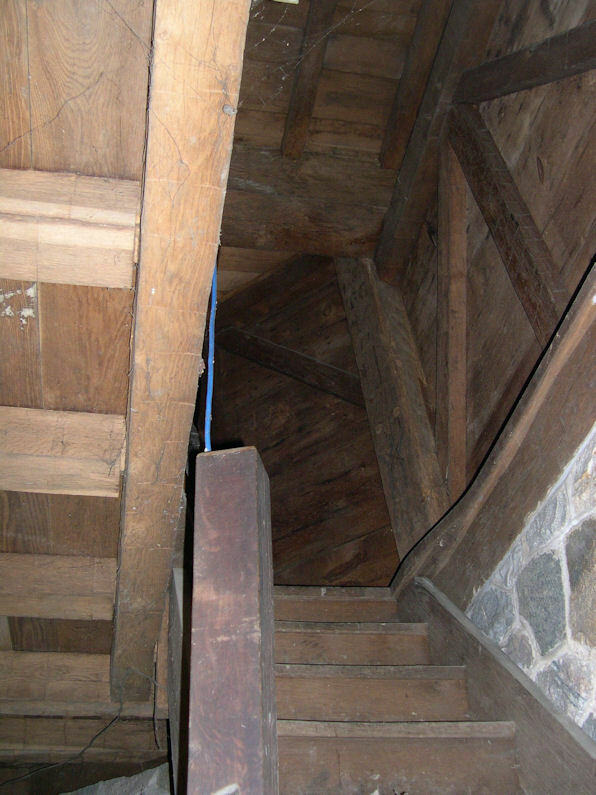 The vertical blade flashes up and down while suspended between the two floors of the building, hence, the name "up and down" saw mill. 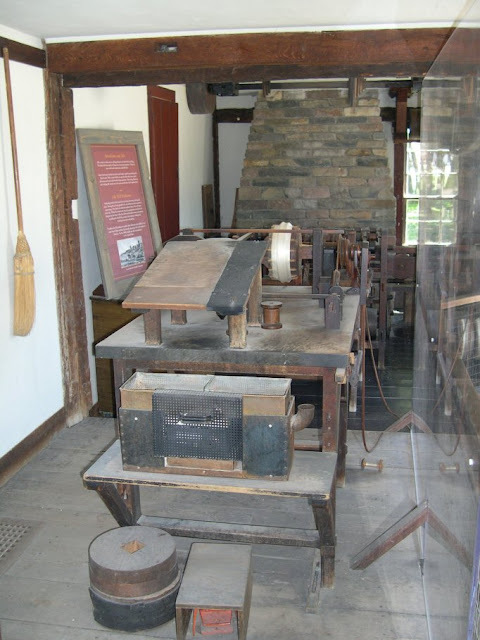 Saw mills were one of the first mills built in local communities, for they supplied the lumber to build all other establishments as well as so many of the household goods and furniture. This mill remained in the Spofford family until the mid-1800's, and the new owners continued to serve the community until 1925. 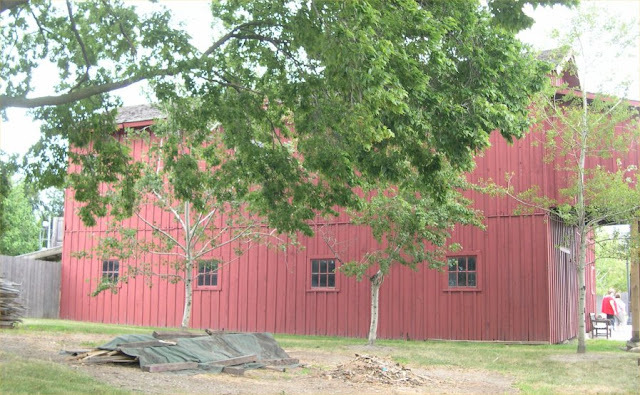 There is also the Stony Creek Saw Mill. 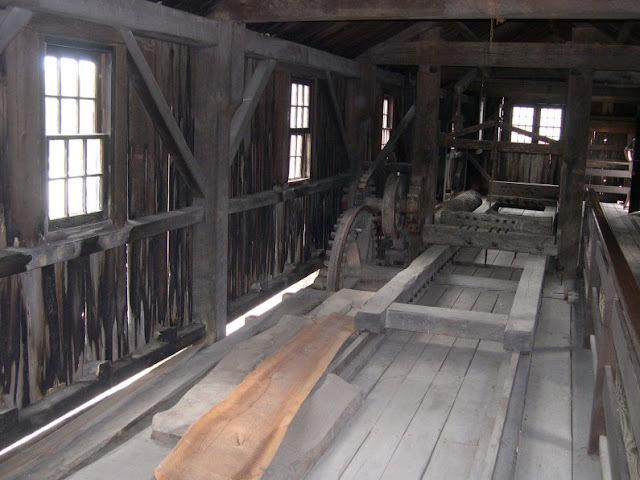 This is a circular saw mill and was used to cut lumber for use in construction. Logs were set on a carriage frame on a track and fed into the spinning saw. 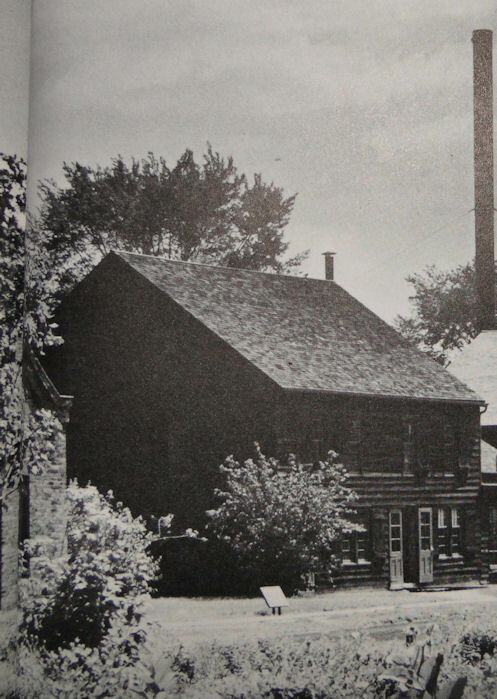 After 1850, circular sawmills were common in Michigan and other lumbering communities across America. 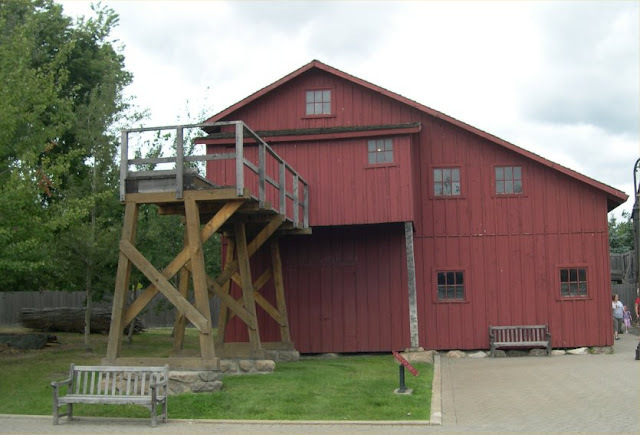 This mill was operated by the water of Stony Creek in Monroe, Michigan, powered by a waterwheel, though Mr. Ford converted it to a steam engine once rebuilt in Greenfield Village. The equipment on the inside of this building is original to the mid-19th century, from what I understand. Unfortunately, at this time I have no photos of the machinery or of the interior at all. 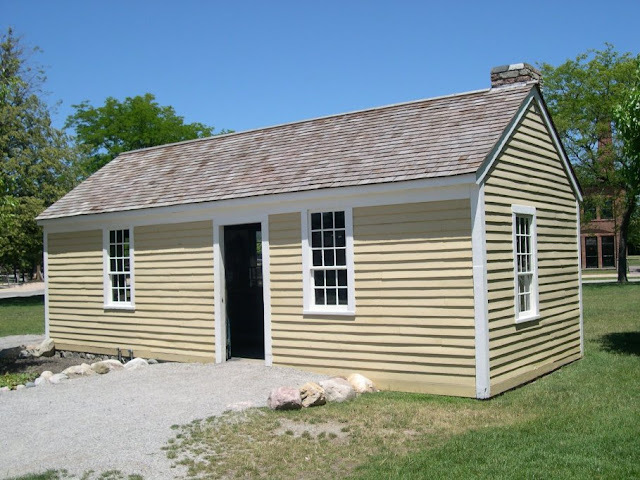 The exterior, according to the Benson Ford Research Center, is a replica of the original structure of the 1850's, built in the Village in 1928. And yet another saw mill known as the Tripp mill. 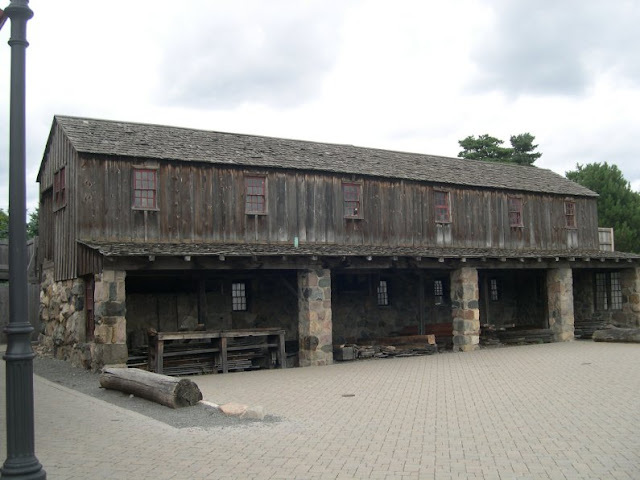 Early settlers in Michigan needed homes, barns, and shops. As farmers cleared the forests for more farm land, the trees provided a plentiful supply of wood. 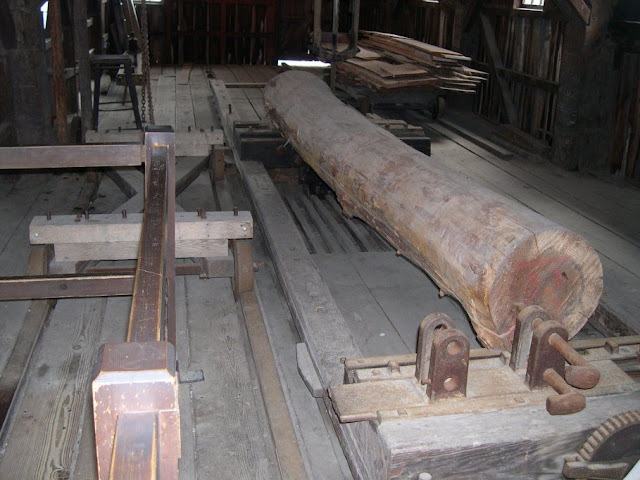 Sawmills were among the first mills established in towns and farming communities, and it was at these sawmills that the wood was cut into lumber to build the homes, barns, and shops. The 1855 Tripp Sawmill, originally from Franklin Center (now Tipton), Michigan, near Tecumseh in Lenauwee County and built by J.D. Tripp, featured an up and down saw similar to the one Henry Ford operated in his youth. 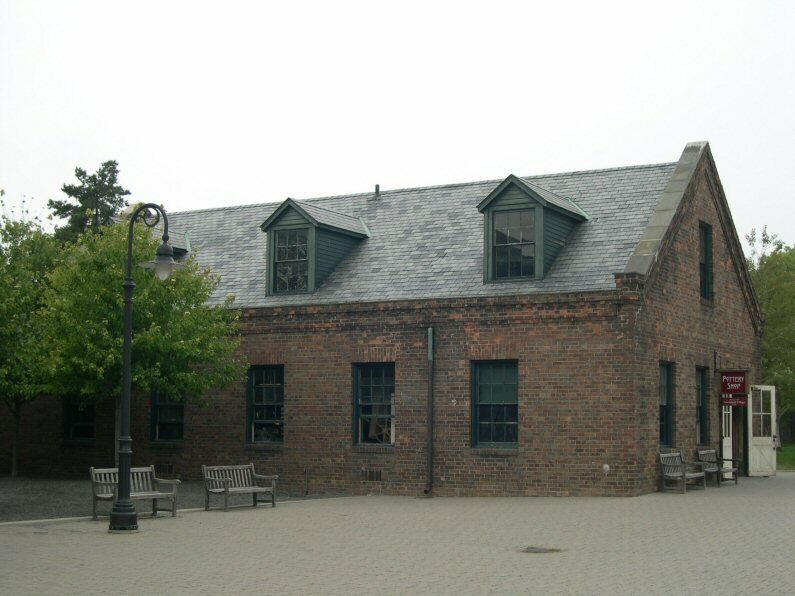 Powered by a steam engine on the bottom floor, the vertical blade flashes up and down while suspended between the two floors of the building, hence, the name "up and down" saw mill. 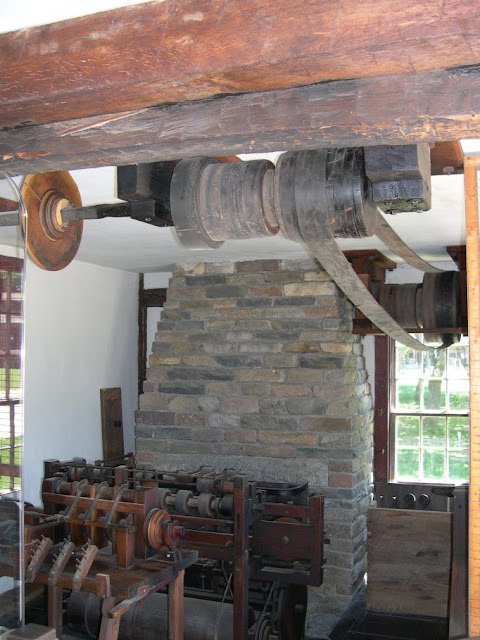 The original machinery in this mill cuts lumber in the 19th century style, by emulating the same motion of cutting lumber by hand with a pit saw, which was invaluable for accurate restorations in the Village. Much Michigan timber went through this mill when the Tripps owned and operated it from 1855 until 1916. It ran for four months out of the year with just three or four workers. During those few months, the workers cut all the lumber that the surrounding community needed. 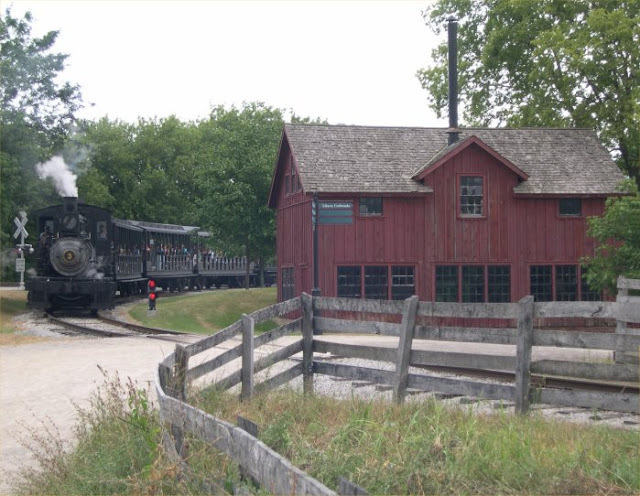 The mill was closed in 1916 when competition from the railroads made it easy to move lumber throughout the region from large scale logging operations. Until the 19th century, America was basically a hand-craft-oriented nation, with craftsmen working at home or in relatively small shops, with hand-action as the main source of power. But the development of water-power helped to greatly lower the need for the hand-crafts. With water driving the turbines that then turned the power gears and belts, the age of machine-made work helped the nation to prosper. What the various mills could produce was seemingly limitless. But by the middle of the 20th century, however, mills became objects of wonder, for they had lost, by then, all prominence in their place in society. Once found in every town across America, by 1950 they had become a curiosity. By the way, as a male civilian reenactor/living historian I find this sort of information useful, for it would have been a man who would have made the trip to the various mills either for work or business. And whether male or female, all would have had some knowledge of the mill trade. The historical facts written herein can be used in our presentations to help bring the past to life for ourselves and for the visitor with historical interest, just as I use what I've learned about taverns & stagecoach travel, shopping, cooking, harvest time, dealing with winter, what it was like to visit a repair shop, the life of a teacher, visiting a doctor, or even mourning rituals to bring my 1860's persona to life. Not only will it fill out the delivery of your life in the 1860's, but it will put you that far ahead of the typical campsitter who only wants to look pretty in her beautiful dress or look like a dandy in his top hat. I know you also love authentic music, and I think this song evokes the end of the mill era! There is so much to the 19th century that is not taught. I feel it's up to people like you and I (and a few others) to keep it alive. I am going to check out the tune - I love the Red Clay Ramblers! And Here They Are...The BEATLES!! !